Stunning Superyacht CLOUD NINE – Image Credit: Yachtfolio. You will undoubtedly be on cloud 9 with this extravagant and contemporary yacht! 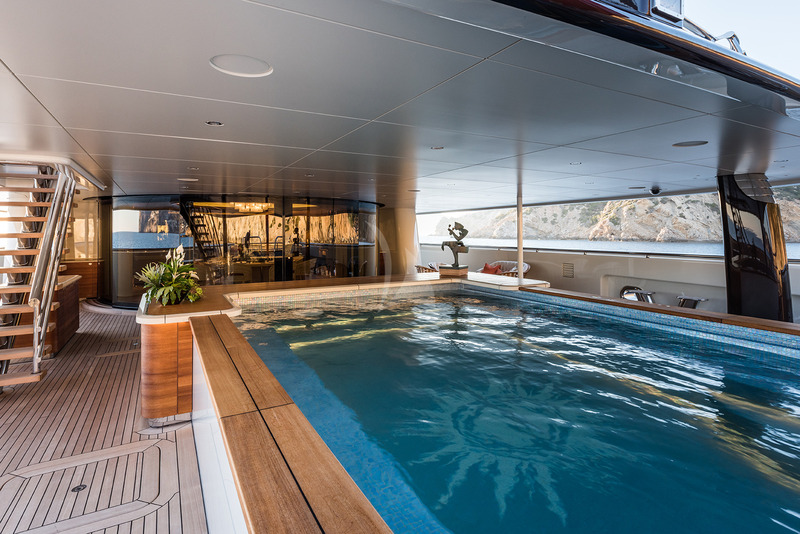 At 74m, CLOUD 9 boasts four exquisite decks, each offering entertainment and luxurious amenities. She is chosen as our Super Yacht of the Week due to her unique features – including her impressive beach club, sizeable main deck pool, saloon cinema and last but by no means least, the sky lounge dining area, these make her stand out from other yachts her size and design. CLOUD 9 spends her summers along the fantastic French Riviera, before crossing the ocean to the Caribbean to chase the sun. The lower deck offers a beach club, unrivalled by most, so you can enjoy the colourful French Riviera towns such as Villefranche from the privacy of your own yacht. Sip a cool beverage of your choice served to you by your attentive crew, before sampling the wide array of water sports on offer. Get your adrenaline pumping off the coast of Monaco flying through the ocean on the Jetski, or get on the paddleboard and explore the secluded coves close up. The yacht offers a Jacuzzi, so you can admire the idyllic Caribbean islands float past as you bathe in the bubbles. As the sun goes down head to the upper deck which provides the upmost comfort on its beanbags and sunpads, so you can unwind with a sundowner and enjoy the views with friends and family. For dinner, CLOUD 9 offers an unrivalled setting. The circular table enjoys the comfort and warmth of inside in the intricate interior, yet the glass revolving doors offer panoramic views of the serene spot of anchorage. As you sample the creative cuisine your private chef provides, you can feel the gentle summer breeze whilst getting a taste of local delights. Enter the main saloon and you are welcomed into a world of elegance and style. The colourful furnishings and textured walls add personality to CLOUD 9, creating characteristic surroundings that everyone will appreciate. Do not forget that CLOUD 9 is a 2017 build, so you have all the contemporary features and the latest technology throughout. The cabins will ensure a peaceful night’s sleep and enable you to feel right at home. 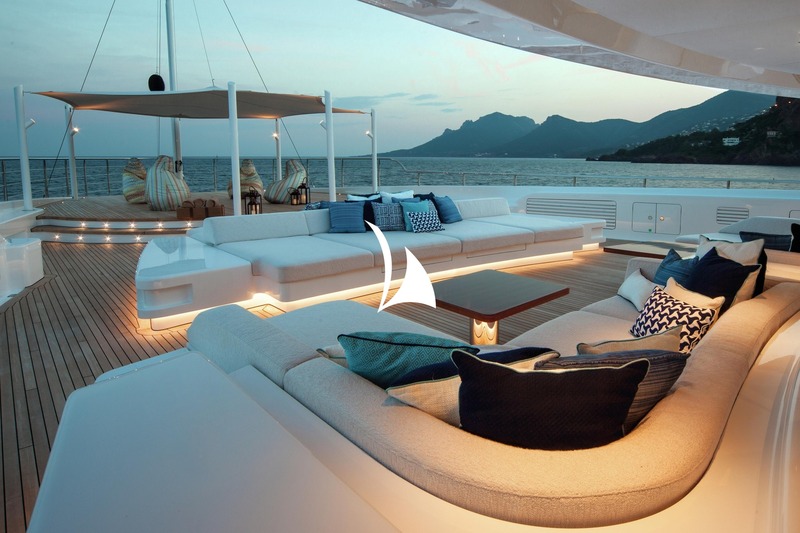 The owner’s deck has large windows facing the bow, so as soon as you wake up you are faced with utter bliss. Moreover, it extends into a terrace which is a remarkable feature brimming with exclusivity and charm to enjoy a light breakfast or to get stuck into a book. 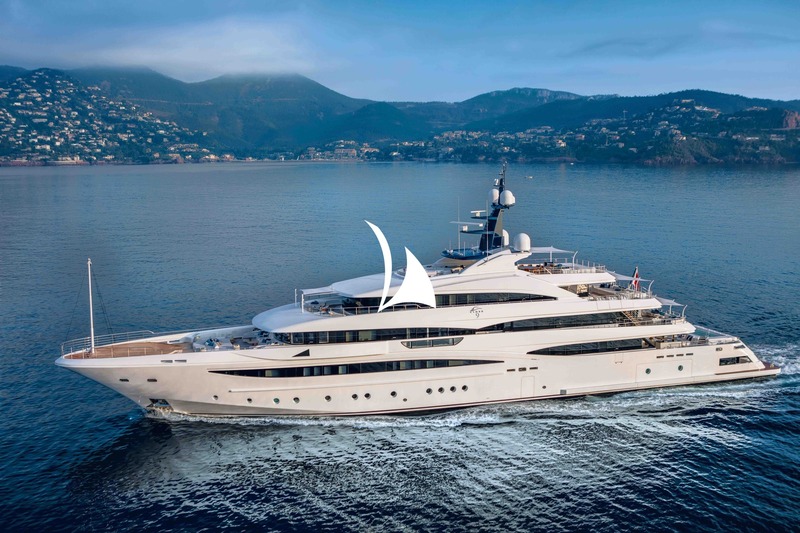 CLOUD 9 is available for charter in the Caribbean and Bahamas in the winter months, and Mediterranean in the Summer months – based out of Monaco on the French Riviera. 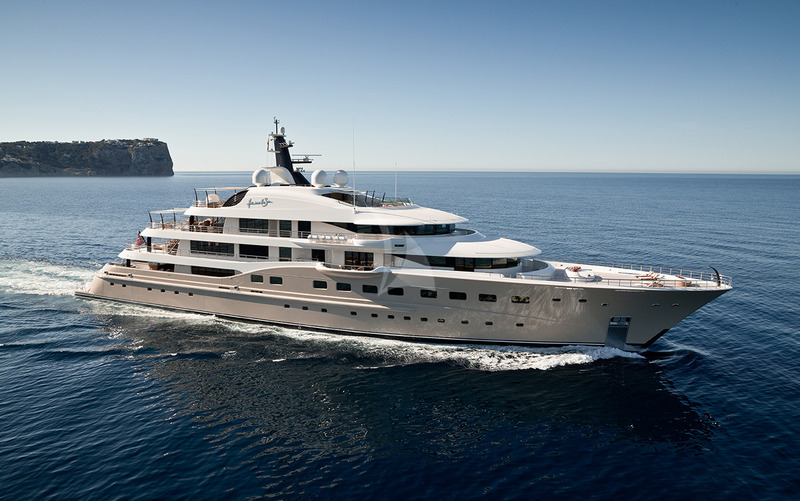 She is for charter starting at €875,000 per week plus expenses. If CLOUD 9 floats your boat, speak to our expert brokers who will guide you through the process of chartering! 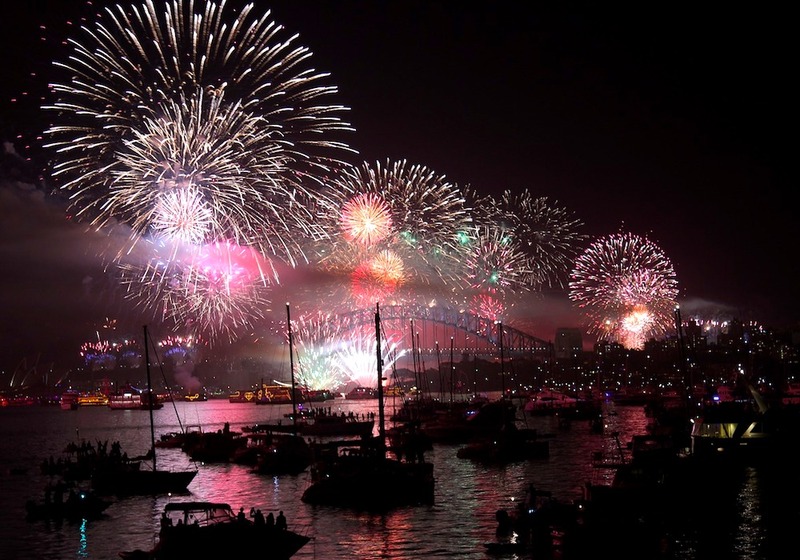 Hire a Boat for New Year in Sydney! Sydney Harbour is famed for putting on one of the most spectacular displays of fireworks to ring in the New Year in the world. Without doubt, the best way to witness this spectacle is from the comfort of your very own luxury yacht. Spend the day cruising around Sydney Harbour, swimming along the coast and relaxing on board, before dropping anchor for the evening’s events. A yacht not only offers the advantage of uninterrupted views but also a great crew on board to take care of you and your guests, making New Year’s Eve the most memorable one yet. Take a look at our Australia Day Charter page to view all of the yachts available for a day charter around this magnificent coastline. Get in touch with one of our brokers to begin planning the ultimate celebration! Our favourite yacht for New Year’s celebrations has to be Crewed Motor Yacht GHOST II – a stunning Gulf Craft motor yacht with a capacity of up to 100 guests whilst cruising at sea, and an incredible selection of water toys! 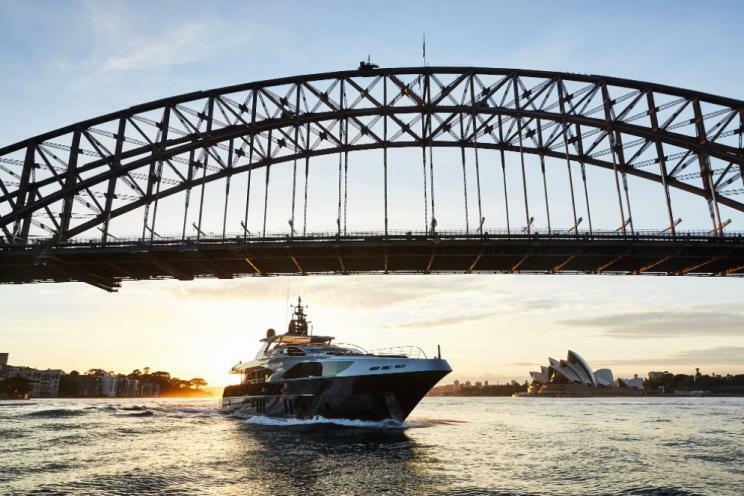 Get in touch today and email charter@boatbookings.com or simply submit an enquiry so we can start planning an amazing evening in Sydney for you and your guests!